Poet Ted Kooser has had quite a year. 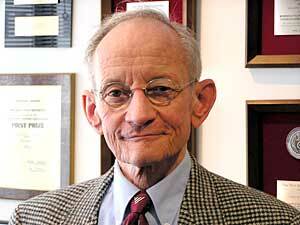 Kooser, a retired insurance executive from Nebraska, was named the U.S. Poet Laureate in fall 2004. And just last week, he won the Pulitzer Prize in poetry for his newest collection, "Delights and Shadows." Kooser is in the Twin Cities for a reading at Plymouth Congregational Church in Minneapolis Monday night. St. Paul, Minn. — Kooser is the first poet laureate to hail from the middle of the country. He was born in Iowa in 1939, and now lives in Nebraska. When his appointment was announced, Kooser was described as "a major poetic voice for rural and small town America. His verse reaches beyond his native region to touch on universal themes in accessible ways." Kooser is the author of 10 collections of poetry, most recently "Delights and Shadows," which was published in 2004. Kooser is in the Twin Cities for a Monday night appearance, and he spoke with MPR's Tom Crann.